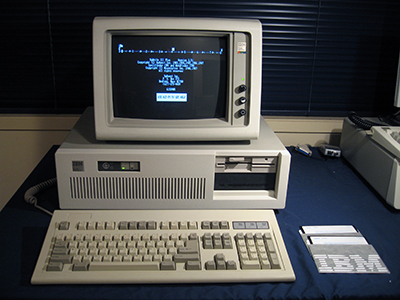 In the mid-1980s IBM lead the business microcomputing market. 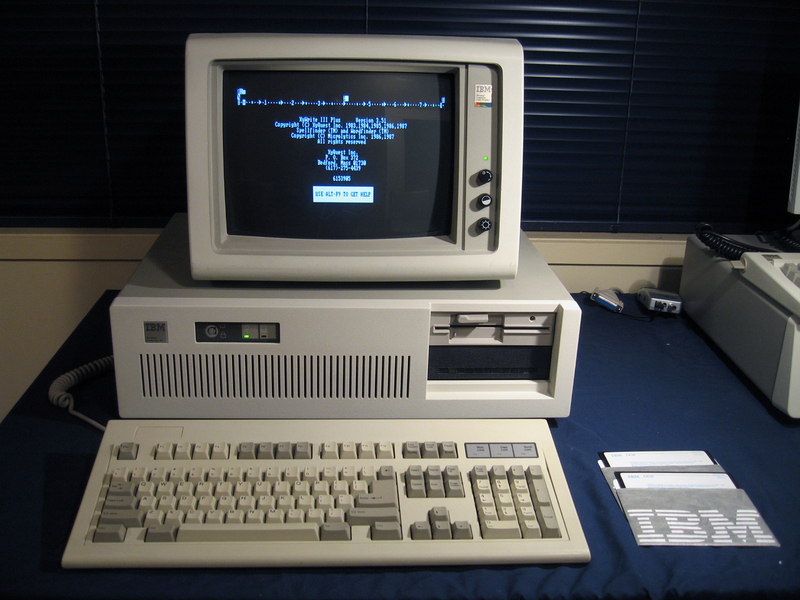 Their unexciting but solid IBM PC and XT models introduced earlier in the decade had been a great hit. They were also easy to clone and the catch cry "IBM Compatible" was seen in computer advertisements for virtually every new business machine (apart from Apple Macs). IBM's next move occurred in 1984 with the release of the IBM AT (i.e. "Advanced Technology"). Among other things, this meant a new true 16-bit processor running at 6Mhz (the Intel 286), eight 16-bit expansion (ISA) slots (as opposed to the five or eight 8-bit ones in the PC and XT respectively), a new keyboard with decent shift keys where they should be, a battery-maintained CMOS which held configuration information and a high density floppy drive which could hold 1.2Mb of data rather than the usual 360k. A fast hard disk (usually 20MB) was standard, and the unit even had a lock on the front panel so users could secure their machines when away from it. The model was introduced with PC-DOS 3.0, which had support for networking. The industry was still happy to follow where IBM would lead, and hundreds of clone makers scrambled to make faster and cheaper replicas. Generally they succeeded. Standards set by the AT, such as the ISA bus, AT-style keyboard and keyboard interface, and battery-powered CMOS persisted for many years. I wanted one of these historically significant machines. Eventually I managed to procure the CGA-enabled unit you can see in the photo. The package on display is Xywrite, a word processor I used on my own AT clone at work for a number of years before succumbing to peer pressure and switching to the ubiquitous Word Perfect. The machine arrived in very good cosmetic condition. Boy, these things are heavy beasts! Moving it around was a good substitute for my gym workout. No wonder so many IT hardware support guys had back troubles in the 1980s! The first thing I noticed was a second 30MB 1/2 height drive tucked under the floppy drive. Sliding the lid off revealed the primary (monster!) 20MB drive, a parallel/serial card, and a 2MB RAM card! That's a good dollop of memory for a mid-eighties type 1 AT. I found the disk controller needed a repair, and some CMOS re-configuring due to a flat battery was required in order to get the computer up and running. However, it now works just fine. I've replaced the graphic's card the machine came with an EGA (Enhanced Colour Adaptor) card. Although many early ATs were fitted with CGA or MDA (mono) display cards when newly purchased, EGA was an important display standard introduced by this machine. The game "Battle Chess" now looks very cool. However, there is still one more item needed for complete authenticity. The discerning enthusiast will notice the keyboard is a plastic generic AT-style clone one, rather than being true blue IBM. Hence I'm on the lookout for the real deal (any offers gratefully accepted). Like the IBM PC, working ATs are rare here in New Zealand. Its weight and size creates storage issues but it's a model I'm pleased to own.